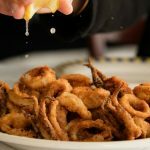 FREE Calamari Appetizer at Alioto’s With the Purchase of One Entree! Free calamari appetizer with the purchase of one entree when you present this coupon! Alioto’s Restaurant is a San Francisco landmark on Fisherman’s Wharf, serving its’ famous fresh Seafood and Sicilian family recipes for over 90 years. Now run by the fourth generation of the Alioto family, Alioto’s is San Francisco’s oldest family owned and run restaurant. 3 hours free parking from 6:00pm to 12:00pm daily. Free calamari appetizer with the purchase of one entree, one per table and upstairs dining only. Free Cup of Clam Chowder with Purchase of Entrée at Cioppino’s! 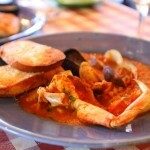 Cioppino is a lusty and flavorful seafood soup which is uniquely San Franciscan. The origin of both the dish and the name came from the Italian fishermen in the early 1900’s, when Fisherman’s Wharf was still called Meigg’s Wharf. Someone would make the rounds of the moored fishing boats, calling out for for contributions to a common, festive stew. One fisherman would toss a nice, fat fish into the bucket, another would drop in a succulent Dungeness crab, another some herbs and vegetables. The cry that prompted each contribution was :Chip In!, Chip In!”. But coming from an Italian throat, this American slang had to end in a vowel. And the “in” was, of course “een”. So “Chip-een-o” was born. It’s been 100 years, but the Italian fishermen are still here, and so is Cioppino, which is our signature dish. Our Cioppino is so good we named our restaurant after it. With purchase of entree. Not valid with any other offer.